“I absolutely think it’s a must win. We feel this is a very important game. We have to put together a stretch of football that we never played before. That’s what we are preparing to do.” — Ben. It’s still early in the week. We are going to evaluate them more and ourselves. We are just going to try to do whatever we think will help us win the game. You know how good of a player he is. You know that you have to step your game up because your offense counts on it. It’s an honor to be on the field with a guy like that. I will continue to watch him. I have watched him for a long time. I know him well. He’s a great football player. Hopefully our defense steps up and helps him not have a good day. You know Drew pretty well? Yeah, I know him just from over the years and doing events and things like that. How close are you to figuring out the run against the pass defense and pass against the run defense and being capable of both and taking what the defense gives you? You can sit there and look at how the Ravens ran the ball and how we ran the ball well but every week is different. The Saints could come in and shut down the run for all we know and we’d have to throw the ball. Or vice versa. That’s why we put together a game plan and have plan, work that plan and plan for the unexpected. Very confident; we feel if we have to run it we can or throw it, we can do that too. That goes to all the weapons that we have and how well the offensive line is playing. Have you ever seen an AFC North race like this? No. There hasn’t been, because Cleveland, as long as I have been here, hasn’t done what they have been doing. It’s pretty fun. It speaks to this division and what each team has done. Have you and other veterans relayed the message of this being a must win game? A little bit. I just think it’s that time of year. It’s November and December football. It’s always a must win game. I don’t care if you are undefeated or if you have your division locked up, anybody that has played the game for a while will tell you that this time of the year is must win. Like you mentioned in 2005, if you get hot at the right time, that’s when teams make runs. That’s when championships can be had. It’s all about playing your best football this time of year. Ben Roethlisberger is producing his best statistical season — perhaps an MVP season — and is on pace for nearly 4,800 passing yards and 35 touchdowns by late December. The way Roethlisberger sees it, winning an MVP would be an “awesome individual honor,” but he wouldn’t trade it for either of his two Super Bowls — or three, if he has his way. Roethlisberger, who has completed 68.3 percent of his passes this season, hasn’t always aligned big statistical years with the Steelers’ highest win totals. In 2009, Roethlisberger threw for 4,328 yards and 26 touchdowns, and the Steelers finished 9-7. These Steelers have a 7-4 record, offensive playmakers such as Antonio Brown and Le’Veon Bell and an offensive coordinator in Todd Haley who Roethlisberger said embraces collaboration. Roethlisberger said he has “no clue” why the perception exists that he and Haley don’t get along, a theme that percolated late last season after a loss to the Miami Dolphins. 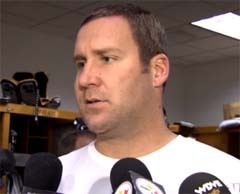 At the time, Roethlisberger quickly squashed what he believed was a misconception. Roethlisberger said he’ll throw a concept Haley’s way and Haley can keep it, tweak it or not use it, and no decision is personal. Roethlisberger said in the offseason he wanted this year to be his best, which he tried to back up by eating right, putting in extra work away from the facility and picking up quarterbacking nuances from “watching the greats.” Roethlisberger effusively praises his offensive teammates for the Steelers’ production, but he also knows his health and his arm are ready for the stretch run.